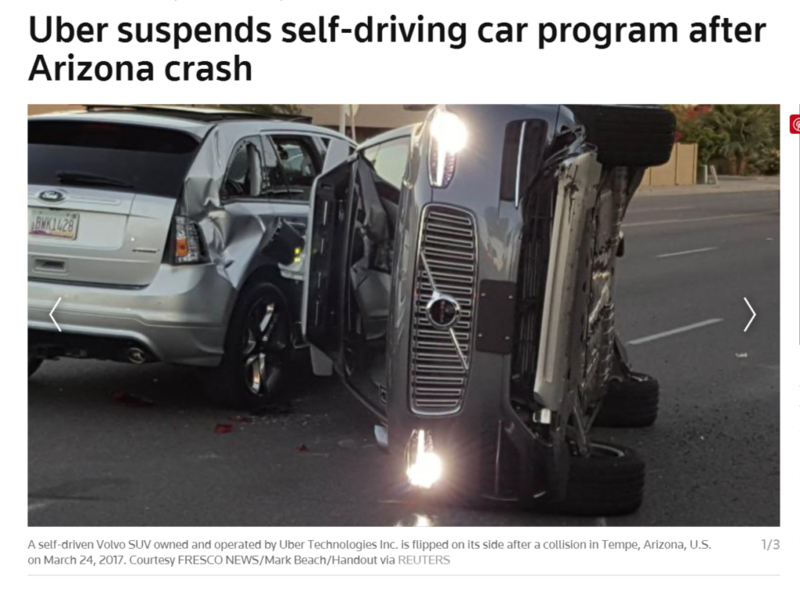 Sadly, as predicted by The Sociopathic Business Model™ in 2016 and in 2017 Uber’s self-driving car claimed its first life in Arizona. On Sunday evening 49-year-old Elaine Herzberg who is believed to be the first person killed Uber’s self-driving car died from her injuries. 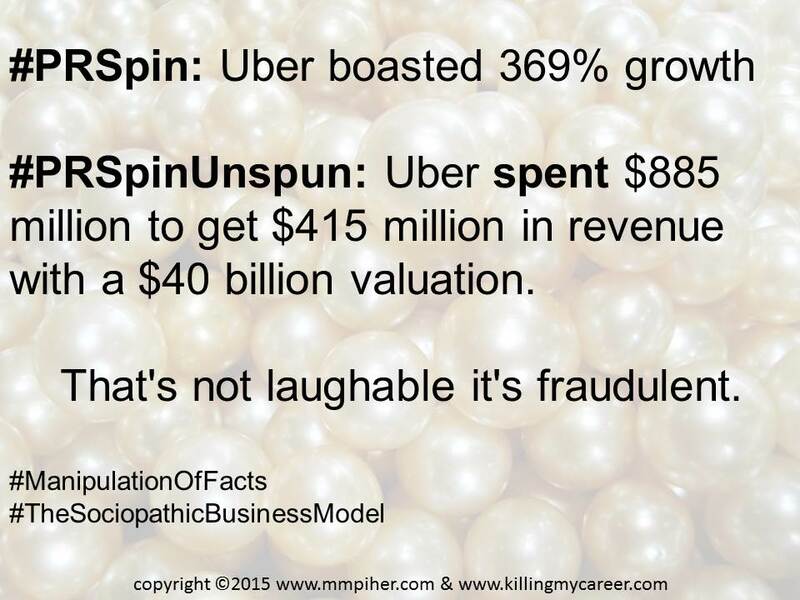 Remember, venture capital-funded startups like Uber under-report adverse events (accidents) putting profits before consumers. Ms. Herzberg’s death is on Uber and on Doug Ducey who both put ego over public safety. As The Sociopathic Business Model™ successfully predicted & warned Arizona Governor Doug Ducey, venture capital funded startups like Uber, often underreport adverse events (aka accidents), which is harder for a company to do however, when someone takes a picture like Fresco News. Now, let’s think about all the *adverse events* that weren’t caught on camera that we’ll never know about, that’s the problem. There’s no expectation that Uber will share these reports with the Governor or the taxpayers because they’re only concern is that of getting VC investors their ROI, at any cost, including our lives. Uber has decided (my favorite) to suspend all self-driving testing as a result in yesterday’s accident. If it can be predicted, it can be prevented but the first-to-market race has too much money at stake and lives will be lost needlessly, where the startups will blame the victims without taking any accountability. Arizona Governor Doug Ducey “with open arms” manipulated facts without recognizing the rights of Arizona taxpayers and voters, when he proudly & unethically announced to Uber “CA may not want you, but AZ Does.” We don’t want it & here’s why: Venture capital funded startups like Uber are infamous for using innovation as a manipulation to evade the law a great expense to employees, consumers and taxpayers. Venture Capital funded startups like Uber aren’t over-regulated they just don’t want to be regulated…at all for investor needs and not consumer safety. Abusive startups will falsely state that people “just don’t like innovation” that’s a manipulation because startups knowingly & willingly think that any laws and regulations don’t apply to them but not because they love innovation but because they’re under tremendous pressure from investors who want 8-10 x’s their original investment (ROI) in 3-5 years. Uber is already failing investors by these standards which means ethical and legal corners already cut are all but ignored now. Uber isn’t over-regulated, they just don’t want to be regulated…at all. That’s dangerous to anyone on the road with Uber’s self-driving cars. Underreporting adverse events (like accidents), utilizing false projections (based on investor ROI) to give the appearance of hypergrowth for an overvaluation is fraud and the cornerstone for venture capital funded startups and for The Sociopathic Business Model™. Venture capitalists (VCs) carefully select and groom first time CEOs* who are easily manipulated, eager to prove their worth and willing to break the law for investors at the expense of consumers. VCs also target easily manipulated government officials, blinded by the billion-dollar valuations (which is not the same as what a company is worth-look to Theranos as an inspiring example) who are willing to harm consumers (who are voters and taxpayers) based on the image of success but no actual substance. Why hasn’t #TheMedia asked Governor Ducey how many jobs are created by bringing Uber’s beta test self-driving project to Arizona? How many Arizona engineers will Uber hire? None, this project already has the engineers that were part of creating the protocol for the testing. It doesn’t matter that a human driver is always in the self-driving car if the actual adverse events (accidents) aren’t reported or blamed on other driver “human error”. We’ve seen it time and time again with medical devices where the company first blames the employee, then the user, and then the victim without ever taking accountability. Uber’s CEO Travis Kalanick and Arizona Governor Doug Ducey are VCs dream because they’re both willing to put the investor profit above consumer safety. As consumer you can protect yourself by forcing accountability from both Uber and Governor Doug Ducey. Don’t let Arizona taxpayers & voters become Uber lab rats. Please contact his office and ask him to take Uber’s self-driving cars elsewhere or you’ll vote him out of office next election. *CEnO as in there’s no way this person is qualified to be a CEO but that’s what VCs want to manipulate to evade the law for their investment at your expense. Melayna Lokosky is a corporate fraud expert and market analyst. Lokosky, a federal whistleblower, helped the U. S. Department of Justice (DOJ) recover $18M from her employer, Johnson & Johnson subsidiary Acclarent in less than five years, when a typical federal whistleblower case takes up to nine. As the first federal whistleblower in U.S. history to write publicly about her active case without breaking the federal seal, Lokosky held both DOJ and J&J accountable to the taxpayers while educating the public about the effects of venture capital-funded fraud. Lokosky negotiated for six months with the DOJ to ensure Johnson & Johnson’s name appeared in the DOJ press release, a vital and precedent-setting detail which forced J&J accountability via SEO and prevented the parent company from distancing itself from subsidiary crimes in which they were complicit. As a result of Lokosky’s case, former Acclarent executives were arrested, indicted, and convicted of 10 misdemeanors and are currently awaiting federal sentencing.